Black Widow #6 is a fantastic read, but what else can we expect from this team at this point? Chris Samnee, Mark Waid and Matt Wilson are a team that is so in sync – so “in the zone” – that I’ve started to run out of words to proclaim how well this trio can tell a story. This is a fantastic issue and their voice/take on Natasha is perfect for what the Marvel U needs right now. I’m going to start by talking about the art, because hot damn, can Samnee and Wilson craft some amazing artwork. Samnee’s pencils are flawless in this issue, every single page a unique piece of awesome and I found myself re-reading this issue a couple times simply to gaze upon the greatness. Samnee’s work is exceptionally expressive, with his artwork often times conveying infinitely more than the dialogue ever could. Wilson’s colour work for flashback sequences is brilliant, and there is no disputing he is one of the top 5 colourists in all of comics. The palette he is using for Black Widow suits Samnee’s work and the story perfectly, and while I have already written this week that Wilson & Dauterman are a dream team, Wilson’s work with Samnee is magical as well. The work they deliver in this issue is a showcase of the power of visual storytelling. No other medium can convey Black Widow’s story in a way that this team can, and they do it exceptionally well. Oh, and the story & dialogue aren’t crap either. 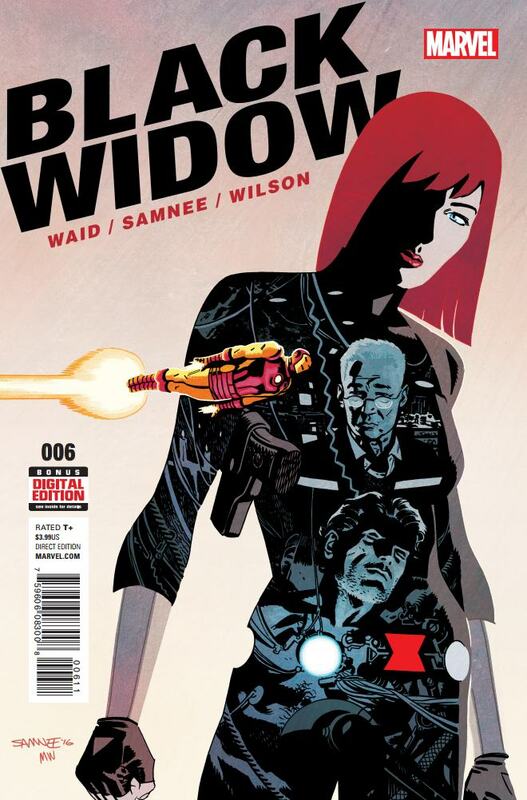 Black Widow #6 is more than just a visual feast, it is one hell of a great Natasha story. This is everything Natasha is to me, and I’m realizing at this point that people other than Ed Brubaker can write kickass spies. The way Samnee and Waid are weaving this tale is perfect thus far, and with each page flip I want more of this story. Black Widow’s relationships have always been complex but this team manages to take everything further in completely plausible ways for the characters involved. This is a grand spy tale featuring one of the most complex characters in the Marvel U and this team is giving readers the Black Widow series they deserve. Black Widow #6 is a great comic. Samnee, Waid and Wilson are bringing their A-game to this title and this is, without a doubt, one of the best comics you will read this month. I can’t wait to see where this gifted team takes this story.